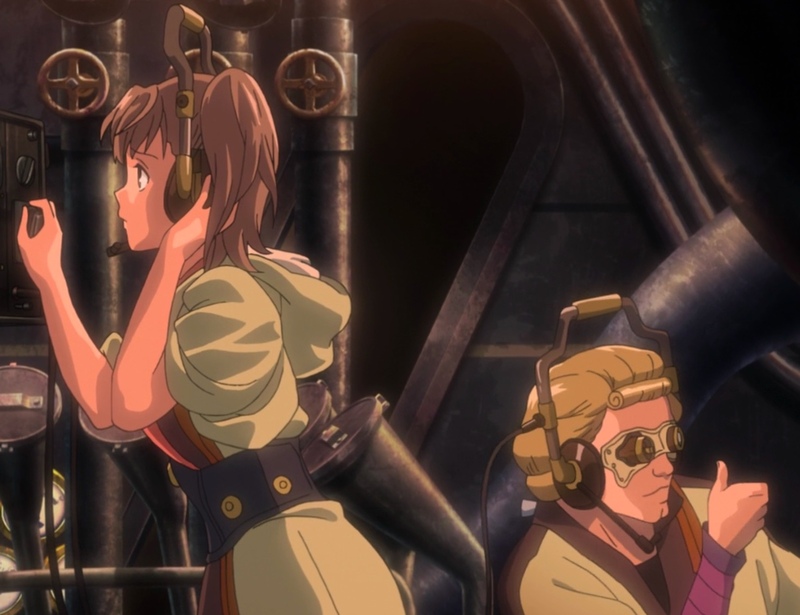 In Kotetsujyo, the 12th and last episode in Kabaneri of the Iron Fortress‘ first season, Biba’s plans bear dark fruit; Mumei declares herself Hozumi, but at a cost; Ikoma fights well for a change; and Kurusu gets to (awkwardly) hold Ayame’s hand. Amazon has some great Kabaneri merchandise. Please check it out! Biba watches as his father’s city burns. Capture from the Amazon Prime video stream. Biba watches as Kongoukaku, city of the now deceased shogun, burns. Many of Kongoukaku’s survivors blame the crew of the Koutetsujou and flock to the stockade where they’re imprisoned. Amid all of the chaos, Ikoma and Kurusu enter the city and fight their way toward Mumei. The more he fights, the more Ikoma loses his sight; Kurusu promises that if Ikoma becomes a Kabane, Kurusu will put him out of his misery. Ikoma’s goal: inject the white blood he got from Biba’s captive scientist into Mumei to save her life. There’s only one dose. As the mob threatens to burn the crew of the Koutetsujou alive, Ayame arrives. She demands they stand down. Their leader points his rifle at her face. Will Ayame be able to convince him to relent? Or will he kill her as so many other people in the city have been killed? Mumei, trapped as the fused colony’s heart, sees the Kabane as red butterflies in her mind. All of the people that she watched die, from her mother to comrades in arms, denounce her for still being alive. As they’re preparing to withdraw, Sahari, Biba’s chief strategist, sees Ikoma approaching. He arrays his troops to stop the Kabaneri. Will he succeed? Will Ikoma reach Mumei in time? What will Biba do to stop them? The shogun’s city burns as Kabane rule the streets. Capture from the Amazon Prime video stream. 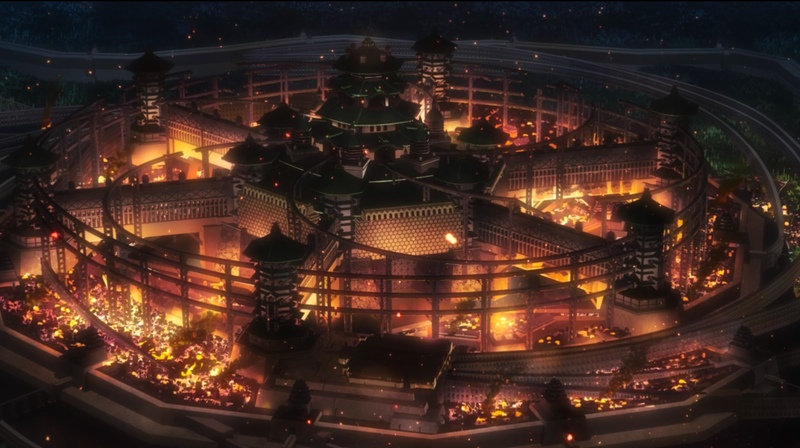 Kongoukaku, city of the now deceased shogun, is in flames. Kabane roam the streets and attack any humans left alive. Some of the city’s survivors gather in front of the stockade in which Kajika and the others from the Koutetsujou are imprisoned. The survivors, armed with farming implements, blame the Koutetsujou’s crew for bringing the Kabane to their city. Elsewhere, remnants of the city’s bushi try in vain to stop the progress of the fused colony whose heart is Mumei. Biba watches and ponders as he sits on the throne. It’s into this scene that Ikoma and Kurusu descend and begin laying waste to vast numbers of Kabane. 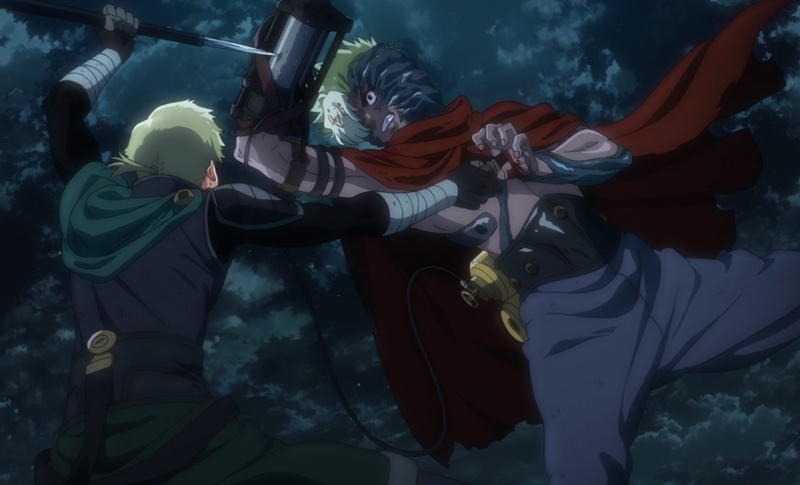 Between Ikoma’s arm-mounted gun, Kurusu’s Kabane Katana, and their cooperation, the Kabane can’t stand against them. After they clear the area, Ikoma notices that his vision is fading. Kurusu is afraid that Ikoma’s silence means he’s becoming a Kabane and promises to put an end to him if that happens. Kurusu was being kind in his own way. They continue toward their goal: Mumei’s fused colony. 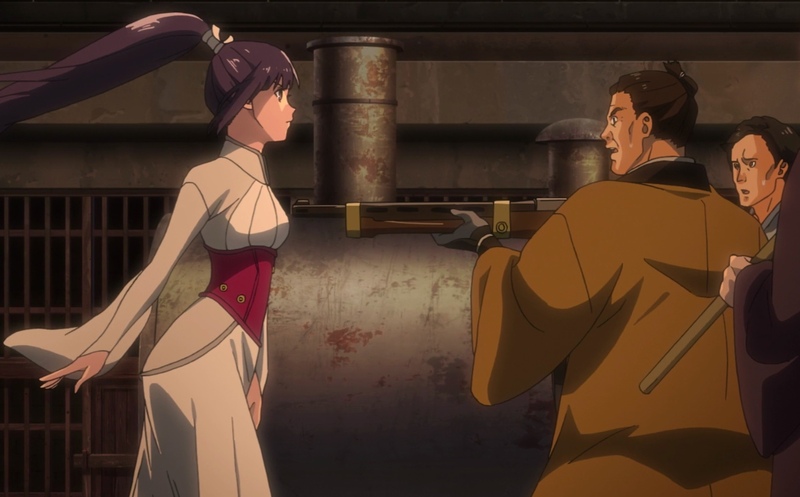 The scientist Kurusu had captured in previous episodes confessed that the white blood would turn Mumei back into a regular Kabaneri. Unfortunately, there’s only enough for one dose. Ikoma’s set on rescuing Mumei. He knows this is a one way trip. Ayame wins the mob over by directly confronting their rebellion — and their fears. Capture from the Amazon Prime video stream. Back at the stockade, the mob is getting ready to burn the Koutetsujou’s crew alive. Ayame arrives with two remaining court officials. She demands they put down their weapons. One of the leaders, declaring it’s her duty to maintain order, points his rifle at her. She walks right up to him, stares him in the eyes, and declares that order exists to protect the people. They must declare war not on each other, but on doubting hearts and minds. Her resolve and courage, not to mention her wisdom, wins him over, and he lowers the weapon. She invites him and the rest to join her people as they escape in the Koutetsujou. Mumei’s physically trapped at the center of the fused colony. In her mind, she’s running away from hordes of red butterflies. She can’t escape them. She begins to see visions of everyone who had ever died around her. They blame her for still being alive. The fused colony reacts to her emotional anguish by rampaging ever more violently through the city. Sahari, Biba’s chief strategist, is talking to Biba via phone to coordinate their escape. Then he sees Ikoma approaching. Biba and Sahari are both astonished. At Sahari’s command, Biba’s minions attack. They didn’t count on Kurusu’s arrival. Between the two of them, Ikoma and Kurusu decimate the opposition. Sahari isn’t Biba’s strategist for nothing, though. 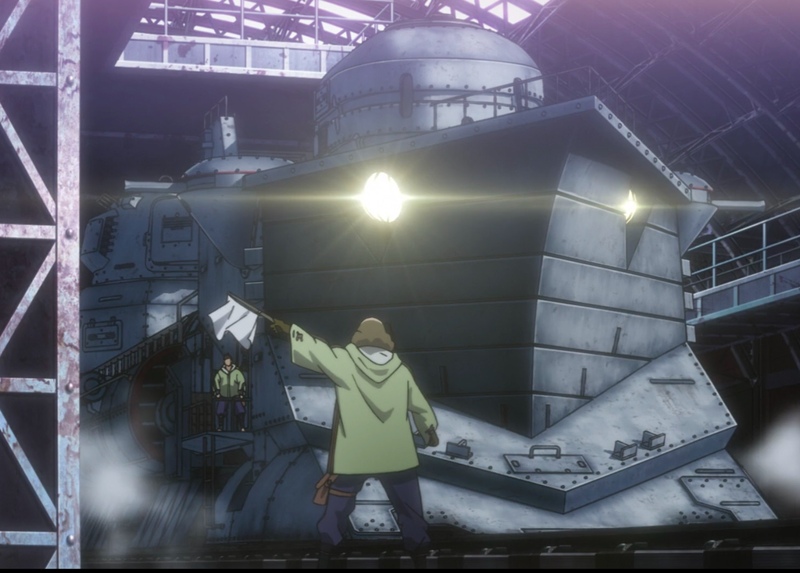 He maneuvers Ikoma into standing on the train tracks as Sahari takes his position on the engine of the approaching Kokujou. Several minions try to hold Ikoma there, and but the time he fights them off, the train’s upon him. Ikoma discovers a new and devastating side effect of the black blood. Capture from the Amazon Prime video stream. Unconsciously, he reaches out his hand. Some kind of magical power born from the black blood propels the train off the track. It explodes, its debris raining onto the burning city below. Ikoma’s vision degrades more quickly. As he’s gathering his wits, Sahari, having jumped from the exploding train, attacks. Ikoma gets the best of him and blows Sahari’s heart through his back. Biba is amazed. Ikoma has taken so much physical, emotional, and psychological damage, yet he does not break. As he’s contemplating that, his scientists approach, saying that the Kabane are spreading too fast. They give him a vial of the white blood just in case. Uryuu, watching nearby, asks in an almost resigned voice if his next target is Ikoma. He’s shocked when Biba says no; Uryuu is to evacuate what remains of their people. Biba says that a dying man is calling him and leaves. A falling boulder separates Ikoma and Kurusu. Kurusu tells Ikoma to continue the mission; Kurusu turns to face the Kabane throng that had followed them. 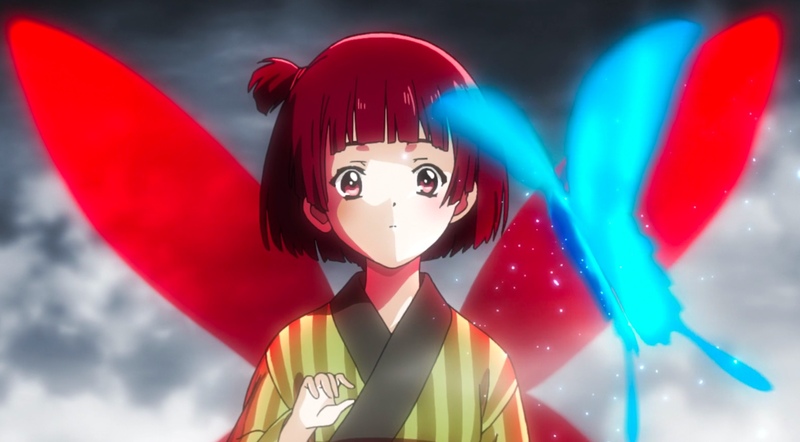 In her mind, the red butterflies have defeated Mumei. She sits, mourning the “weak” part of her that can never return. Then she senses Ikoma’s approach as a single silver butterfly. As it approached her, the horde of red butterflies swarmed it. The fused colony crashed to the ground, its heart lost to confusion. 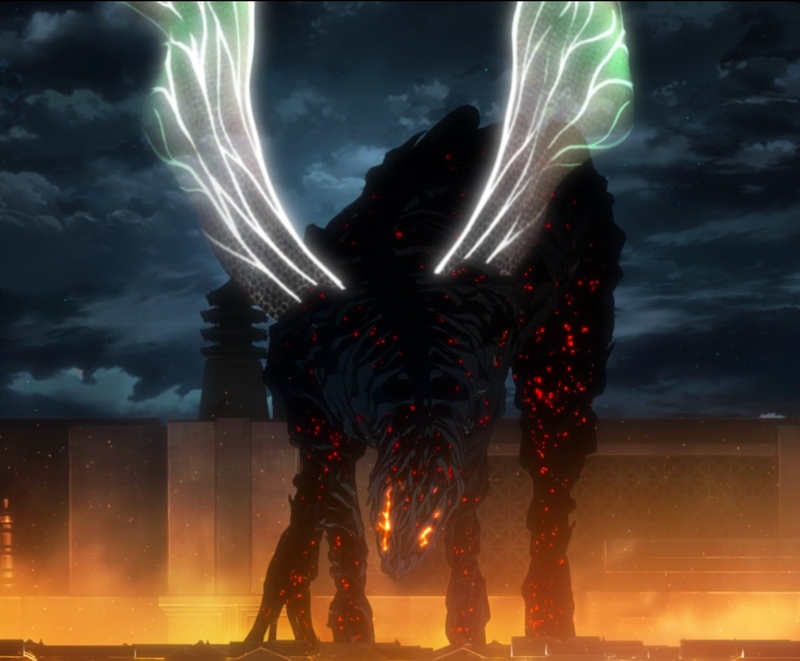 In the physical realm, Ikoma approaches the fused colony, its silver heart clearly visible. Before he can get to Mumei, though, Biba arrives. Biba arrives to stand between Ikoma and Mumei. Capture from the Amazon Prime video stream. Ikoma’s vision is half gone by this time. As Biba approaches, he says he’s been waiting for a soul that has no fear; here’s here to hunt it. He rushes Ikoma, who also springs forward. As they fight, Biba asks what’s so important that Ikoma would take the black blood. Ikoma answers that he promised to turn Mumei human again. Biba, a solider with years of training, is able to thrust his Kabane-blade into Ikoma’s shoulder. Mumei, still trapped in her mind, sees the single blue/white butterfly surrounded and beset by uncountable red butterflies. But Ikoma’s not done yet. Gathering his remaining strength, using the same power he used on the Kokujou, he shatters Biba’s blade and throws him to the ground. And though Biba’s counter attacks and breaks his left arm, Ikoma uses that same power again to disentangle himself. But as he moves to strike Biba, Ikoma’s vision fails, and he stands, blind and defenseless. Biba immediately understands what’s happening and quietly moves behind Ikoma. Mumei, still perceiving the world around her euphemistically, tries in vain to call out. Then she forces her physical self to drop the river stone into the water. Somehow, Ikoma used that sound to locate Biba, and he fired his weapon. He severs Biba’s left arm. Moreover, he reveals that Biba was a Kabaneri, too. Stunned, weakened by the loss of blood, Biba collapses. Ikoma makes his way towards the sound, knowing Mumei was there. Finding her, he injects her with the white blood. The fused colony melts away. Mumei comes free of it. Mumei regains consciousness on her back in the water. Somehow, she’s found the river stone again. Her happiness at seeing it quickly turns to dread when she sees Ikoma, his last strength spent, laying unconscious. She’s horrified when Biba rises and begins firing at the fallen Ikoma. Sometimes, it’s hard to keep a bad man down. That’s when it’s time for teamwork. Capture from the Amazon Prime video stream. Telling Ikoma that he’s not done fighting yet, Biba rushes forward, about to stab Ikoma with the remains of his Kabane-blade. Mumei, her Kabaneri strength restored, darts between them and stabs Biba through his Kabaneri heart. He can’t believe she raised her hand against him. Telling him that she wishes he’d listen to her sometimes, and that she intends to eat rice with her friends in the future. “I see, Mumei,” he says. She catches his body as it falls and lays it gently on the ground. Back at the Koutetsujou, the previously useless community leaders (the ones who had demanded Ayame turn the Koutetsujou over to them in earlier episodes) helped organize the refugees as they boarded. Meanwhile, Ayame, good guy Kibito, Yukina, Sukari, and other plan their escape route. They’re at a loss; all of the rail lines seem damaged. That’s when Uryuu arrives with a handful of Biba’s minions. Except for Uryuu, they’re all injured. He offers to tell them the escape route that Biba had planned. The condition? Ayame evacuates them along with her people. Ayame’s bushi are aghast. A little girl, remembering how Biba’s people had treated her and her family in captivity, strides up to him and slaps him across the face. He seems to know he had it coming. Ayame takes the now crying girl in her arms and says they should cooperate. She observes that the minions here are hurting, or they would have used force to compel the crew of the Koutetsujou to obey. In gratitude, Uryuu not only tells them the way out, he tells them that Ikoma and Kurusu are now in the city. Suzuki figures out how to connect Kajika to the shogun’s public address system. Capture from the Amazon Prime video stream. Kurusu arrives to find Mumei/Hozumi kneeling beside the still unconscious Ikoma. As they’re trying to decide what to do, they hear Kajika’s voice telling them where to meet for evacuation. Suzuki and the other steam smiths had found out how to tap into the shogun’s public address system. 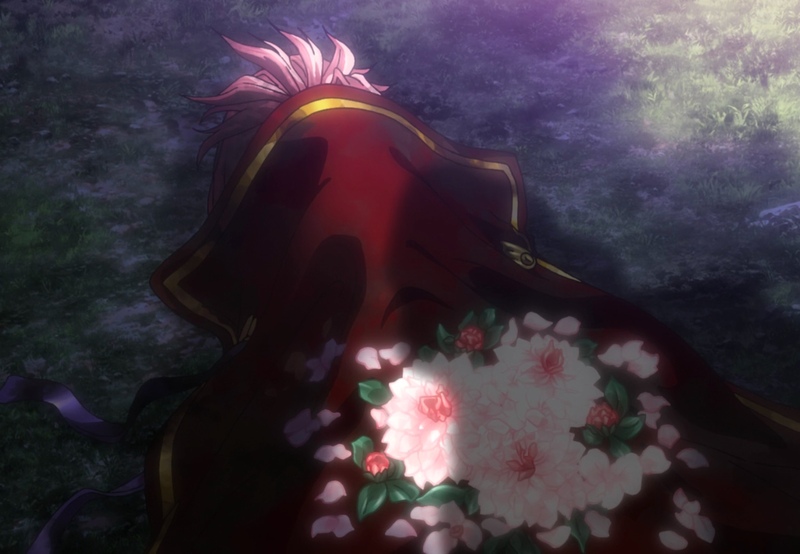 Mumei leaves her brother’s body covered with flowers. Kurusu shoulders Ikoma, and they head for the rendezvous point. Mumei scavenges a rifle and clears the path for the burdened Kurusu. Unable to stop because of the Kabane, the Koutetsujou hoists a capture net. Mumei throws the unconscious Ikoma, then leaps herself. Kurusu jumps, and almost falls off. Ayame grabs his hands just in time to steady him. He blushes. But he doesn’t let go as he announces that he has returned. The train leaves the city. Mumei/Hozumi ties to wake Ikoma. She says he can’t die; he promised to turn her human again. He finally comes to and asks her to stop shaking him. 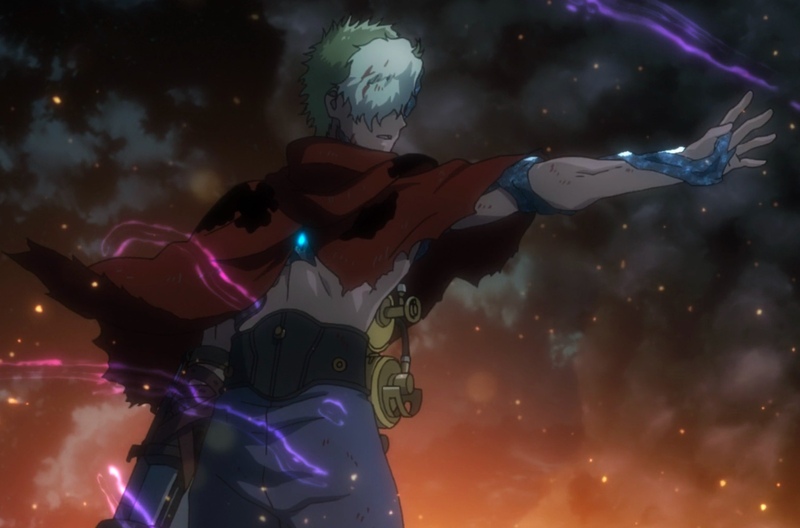 As his glowing blue/white heart shrinks and becomes a “normal” Kabaneri heart, she realizes that somehow, her brother had given the white blood to Ikoma. As the Koutetsujou crosses a lake, Mumei/Hozumi returns the river stone to Ikoma, saying that he “forgot” it. She smiles. Mumei’s fused colony was graceful, almost beautiful — and utterly lethal. Capture from the Amazon Prime video stream. The animation for Mumei’s fused colony was beautiful in a terrifying way. It was mammoth but moved gracefully; graceful yet deadly. I’ve lived the OP (opening music) since I first heard it. It’s melancholy, it’s dramatic, and it’s fast-paced. Egoist’s vocalist strikes just the right tone. You can buy the song from Amazon if you’re interested. In this episode, Kurusu seems to have accepted Ikoma as a comrade in arms. After their first battle since entering the city, Ikoma takes a moment to gather himself, and Kurusu is afraid he’s succumbing to the effects of the black blood. 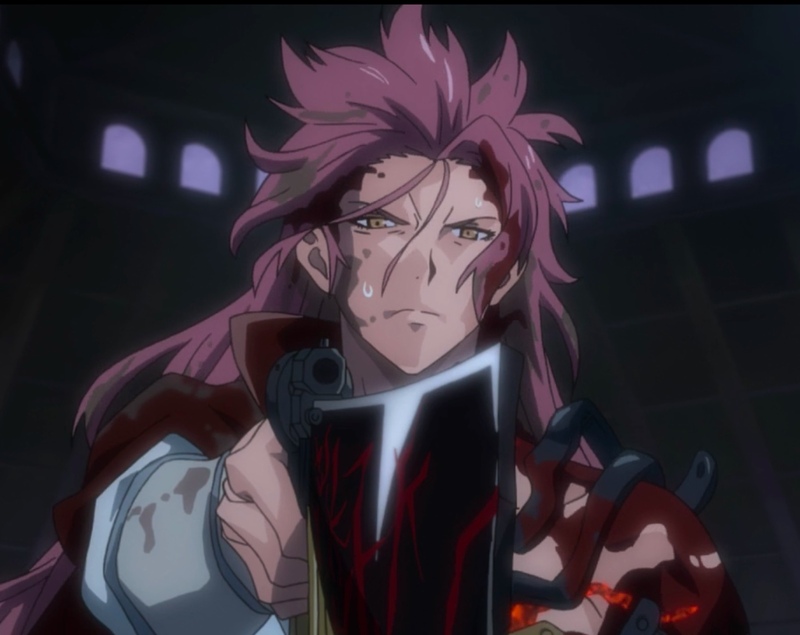 When he says he’ll kill Ikoma before that happens, I think Kurusu was being kind in a military sort of way. He wouldn’t let a comrade become a Kabane, and the unstated agreement is that Ikoma wouldn’t want to become a Kabane. Ayame has come a long way since the first episodes! Before, she was demure and self effacing. She avoided confrontation. As the series moved forward, she pushed herself to grow into the leadership vacuum left when her father fell and became a Kabane. In this episode, she showed that her courage had blossomed, and she was able to unflinchingly confront an armed man and talk him down. There’s no substitute for character development. For me, Ayame’s growth practically justified the whole series. Though I question Sahari surviving the train’s explosion, I have to admit it felt great to hear Ikoma say, “You killed too many” as he fires his gun. Sahari had to go. I recognized the music was designed to evoke the emotion. I saw how the plot positioned Mumei’s moment of despair to enhance the feeling. But darn it, I thought Mumei’s reaction to Ikoma’s approach was spot on. Trapped in her own imagination, Mumei nevertheless senses Ikoma’s approach. Capture from the Amazon Prime video stream. Ikoma put up a good fight against Biba, but even with his Kabaneri strength, he’s still a steam smith. True, Mumei and Kurusu both tried to train him, but he’s no warrior. If he had been alone against Biba, he would have lost. And I like that! He’s a realistic hero whose dreams are way bigger than his ability to deliver. But that’s not the end of the story. He’s not alone; he has friends like Mumei who step in when he needs help. Since I hate indomitable and perfect heroes, I really like Ikoma’s character and the course he took through the series. The pose Mumei had when she stabbed Biba was almost identical to the one she had when she stabbed Ikoma. The only difference I could see was an important one: the height of the blade. Precision was always important to Mumei. Mumei (Hozumi!) got to land the finishing blow on Biba. Ikoma took it as far as he could. He achieved his goal of saving Mumei. Then, she got to return the favor. I also thought she showed her superior moral character when she caught Biba’s body as it fell. In her eyes, she was still his brother, and though she knew she had to kill him, she didn’t have to lose her essential humanity to do it. That was the high point of the show for me. Uryuu had to know that his proposal (Ayame taking him and the remnants of his men) on the Koutetsujou could be unpopular. He showed his character when he took the little girl’s slap and didn’t reproach her. I think the narrative prepared me for Uryuu being a reasonable man, and I thought his proposal was a brave front to a desperate plea. Across the whole series, this is my favorite shot of Biba. Mumei even left flowers for him — more a reflection of her humanity than his. Capture from the Amazon Prime video stream. I thought the idea of a capture net was a bit over the top, but I had to chuckle at the gusto Mumei showed when she threw Ikoma. So Kurusu finally made some headway with Ayame! 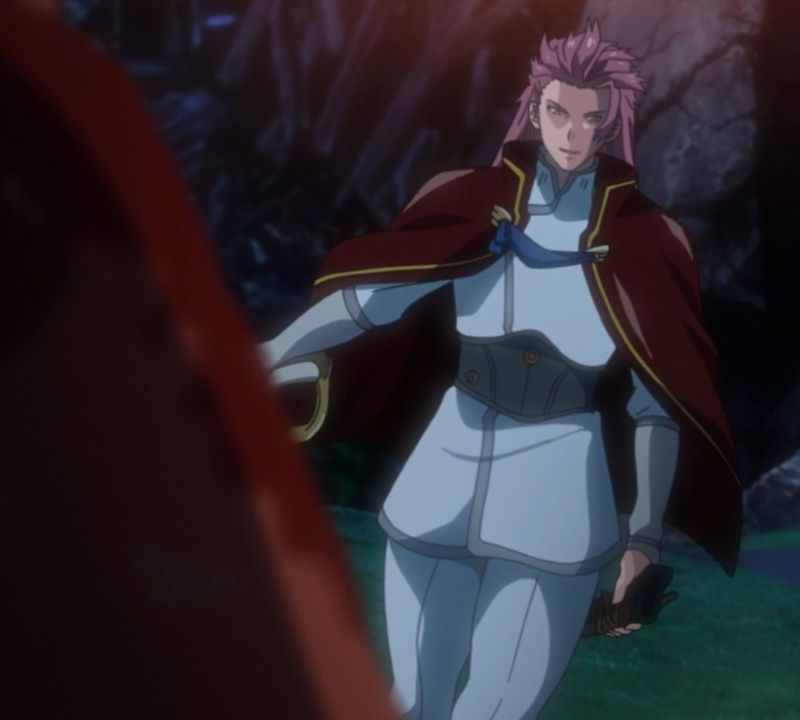 It’s adorable to see a warrior of his calibre reduced to blushing while just holding hands with his princess. I thought it was touching that Mumei/Hozumi called Ikoma her shield as she tried to wake him up. I really enjoyed seeing their relationship develop. It never descending into some parody of a romance, which was great, given her age. Instead, he saw her as a little sister, and she came to see him as a protector. As Ikoma regained consciousness, Mumei/Hozumi’s smile was beautiful. Oh, Ikoma. Why’d you stand on the train tracks as the Kokujou approached? I know you’re a steam smith unschooled in battle tactics, but dang, dude! Don’t stand in front of a train! Well, maybe Sahari really did tell his men to trick Ikoma to stand there. That’s how I presented it in my description above. Otherwise, Ikoma’s action would have ruined the scene’s dramatic effect! And using a hand gesture to throw a train off its tracks? If the scene wasn’t so stupidly cool (animation and music were really over the top), I might have something negative to say about that! Sahari survived an exploding train? Really? Well, at least we got to see Ikoma address the problem. Capture from the Amazon Prime video stream. I get that Sahari is a strong fighter. But surviving a violently exploding train? And landing on the tracks? And still being in good enough shape to attack Ikoma? Over the top I can take; pretending there’s no top is a bit much. So, Biba’s been waiting for a soul with no fear? What’s that about? When did that theme start? And what does he mean that Ikoma had no fear? He was plenty afraid, and he admitted it, too! Either Biba’s a complete idiot (plausible! ), or he’s cliche (plausible!). Or he’s a cliche idiot (probable?). Where’d Mumei get the river stone? Was it the same one? I don’t understand how she could have gotten it when the last time we saw it was in Takumi’s dead hands. I didn’t think that the city needed to blow up as the Koutetsujou left. The scenes of the tracks collapsing just as the train cleared them, at least in my opinion, weren’t necessary. It’s like the end of a James Bond film where everything blows up at the end. Where’d they hide all the explosives? Do Kabane sudden blow up when they see their prey escape? I mean, I know it sounds strange to complain about hyperbole in this series, but I founds the explosions to be too much. The Koutetsujou was to this series what the Enterprise was to Star Trek. Capture from the Amazon Prime video stream. Honestly? Kabaneri exceeded my expectations. Yes, I got all three of the things I expected. But, especially for number 3, Kabaneri goes beyond Attack on Titan. Ikoma, a steam smith, becomes a Kabaneri with aspirations to save humanity. He sort of succeeds on a small scale and has to rely on comrades and friends to make real headway. Ayame starts out as a shy wallflower and ends up using her leadership to defuse a lethal situation and save her people. Mumei starts out as a unidimensional killing machine utterly devoted to a manipulative brother. She ends the series with her humanity intact and her emotional ties to Ayame and her crew stronger than ever. Putting the positive notes aside for a second, I have to say something negative: Biba. I get his motivation, but I think he could have been a more compelling villain. The team around him, I could understand. Some of them joined with the Hunters because they loved killing. Most, like the tragic Horobi and Uryuu (always uncomfortable with the excessive cruelty some of his fellows displayed), felt like well-drawn characters who were as much victims of circumstance as anything else. But Biba? I couldn’t buy into his pathos. 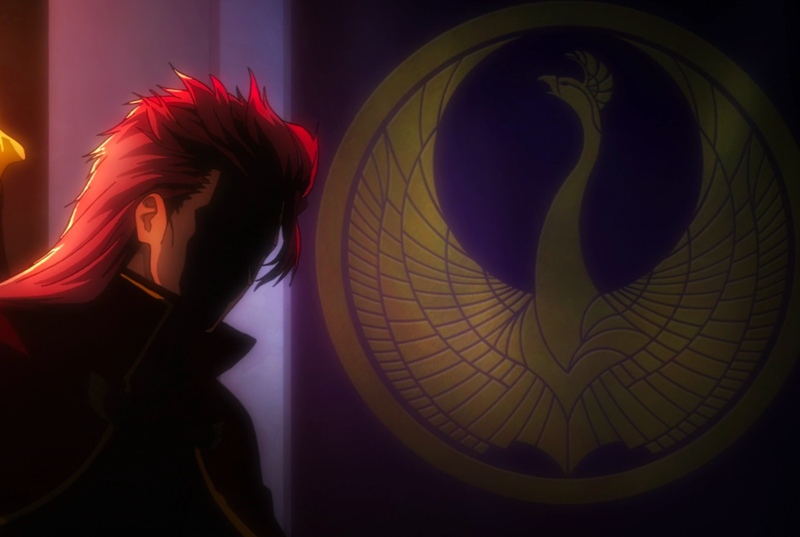 Now that Biba’s out of the way, I want to give honorable mention to the Koutetsujou. The Koutetsujou is to Kabaneri what the Enterprise is to Star Trek, or the Seaview is to Voyage to the Bottom of the Sea. While maybe not as fully realized as those other more famous ships, the Koutetsujou is as much a character in Kabaneri as many of the people. It has an exciting design, it behaved according to fixed rules, and the characters in the series depended on it to keep them alive. I have to say that I liked that Hayajiro. It helped define the show’s character. All in all, a great start to what I hope’s a long franchise. You might be able to increase the odds of that happening. Crunchyroll just announced they have the rights to Kabaneri’s home video release. I hope it’s a profitable partnership for them and Kabaneri’s creators!